Two men hang a banner with the names and faces of the six victims of the 2014 Noyes Street fire in Portland on Sunday at a memorial gathering. 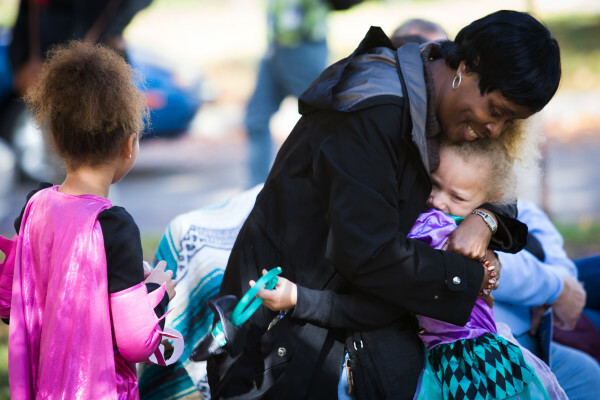 Thelma Summers, mother of Steven Summers, hugs her granddaughters Audryn, 7, (left) and Maliyah, 5, at a memorial gathering on Sunday in Portland for her son and five other victims of the Noyes Street fire in 2014. 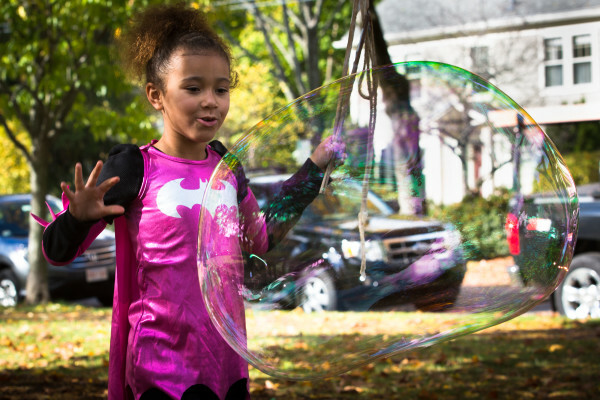 Audryn Summers, 7, makes bubbles on Sunday in Portland at a memorial gathering for the victims of the 2014 Noyes Street fire. Summers' father, Steven, died as a result of the blaze. 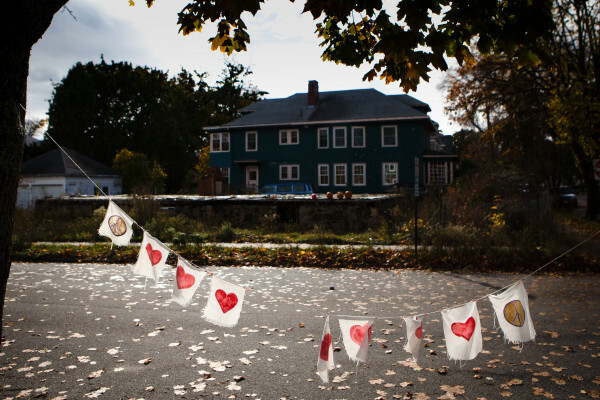 A string of hearts still flies across the street from the scene of the Noyes Street fire on Sunday in Portland. The fire claimed six lives. 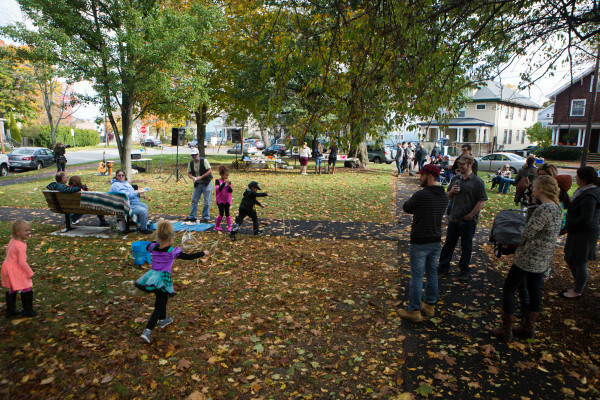 During a memorial gathering in Portland Sunday, people socialize, talk and remember the victims of the 2014 Noyes Street fire. PORTLAND, Maine — Across the street from the park where roughly 50 people gathered Sunday to mark the approaching anniversary of Maine’s deadliest house fire in decades, a jack-o’-lantern carved to say “RMBR Noyes” sat on a burnt-out foundation that had once been a home. But some of those gathered for the memorial said they won’t be going to see the small tribute. Two years after the fire that killed six young adults, Halloween still hurts, and it’s still too painful to walk by the house where his friends died, said David Foster, 36, who organized the gathering. Foster said he also wanted to take this year’s memorial to David Bragdon Jr., 27, Ashley Thomas, 29, Nicole Finlay, 26, Steven Summers, 29, Maelisha Jackson, 23, and Chris Conlee, 25 in a new direction. The anniversary of the fire comes hard on the heels of the trial of Gregory Nisbet, 51, who owned the building at 20 Noyes St. when it burned. Although the fire was ruled accidental, Nisbet was charged with manslaughter in connection with the six deaths because of his alleged failure to keep the building up to code. But earlier this month a judge acquitted him of all charges, save a single fire code violation. No verdict could’ve brought his friends back, Foster said, so this year he tried to honor their fun-loving lives by bringing some joy to the somber occasion. But even with the passage of time, live music and Halloween candy, many of those at the memorial still seemed raw from the tragedy. Like Foster, Libby Barnes worked with some of the residents of 20 Noyes at The Great Lost Bear, a local bar. Barnes had planned to go see her friends and co-workers for a Halloween party the night of the fire but didn’t end up making it out, she said. The next day her phone rang and she learned they were dead. People attending the memorial clustered in small groups throughout the park. They talked amongst themselves and several declined to speak publically about their grief. Children played with bubbles as three men strung a banner with the names and faces of the dead between two trees. Soon after they’d finished Foster stood beneath the banner and briefly addressed the small crowd.